One of the big selling points of smartwatches is the ability to control apps without needing to pull out your phone. However, due to the absence of an official Apple Watch app, adjusting music in Spotify using Apple’s smartwatch always felt kind of clunky. Now that’s changing. Spotify is finally gracing Apple Watch owners with bespoke software after months of rumors and speculation. 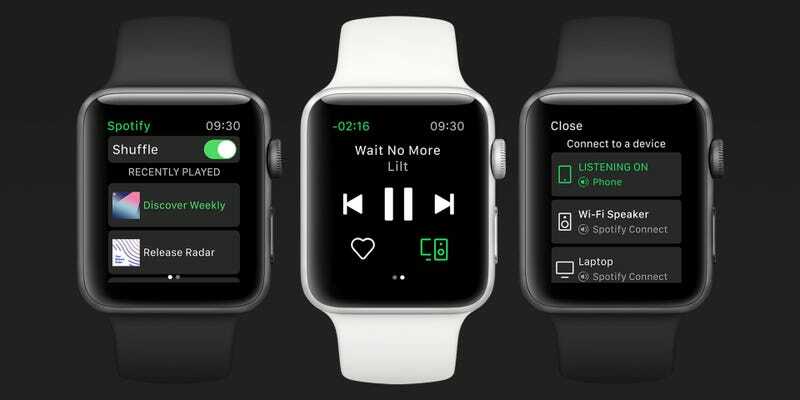 While the Watch app lets you control music and favorite songs playing on your phone or Spotify Connect devices, it doesn’t offer the ability to download songs or podcasts to the device offline. It also doesn’t let you stream music from the Watch to Bluetooth headphones on Apple Watches with built-in 4G LTE.